"Guardians on vital strike missions have found signs of Toland the Shattered, a once esteemed Warlock whose obsessions led to his exile. The Vanguard would like you to investigate his trail." Obtained: This Bounty seems to be randomly awarded when turning in completed bounties. You may also be able to obtain this by reaching Vanguard Rank 2. Complete a heroic or epic Strike to obtain "Toland's Journal (Fragmented)". Bring the journal to Ikora Rey to obtain ""Toland's Journal (Decrypted)". Bring the journal to the Gunsmith to obtain "Black Market Coupon". 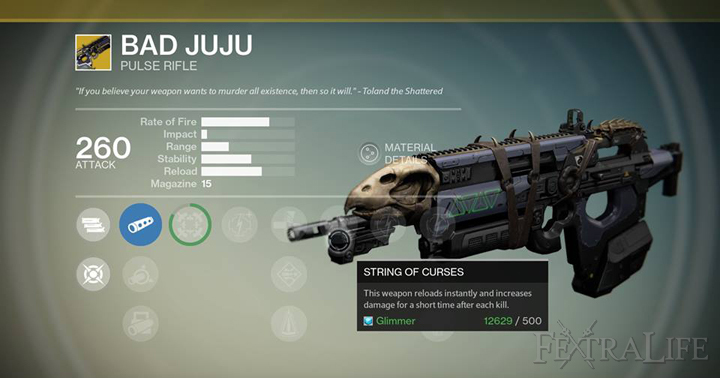 Bring the Weapon Frame to the Gunsmith to obtain ""Darkness-Infused Pulse Rifle". Defeat guardians in the Crucible to obtain ''Sated Pulse Rifle''. 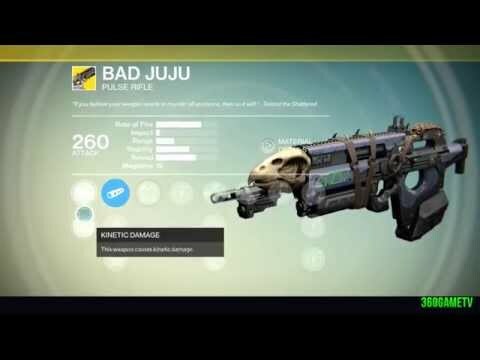 Return the weapon to the Gunsmith to obtain Bad Juju.